Peak running speed is a better predictor of running performance (e.g. marathon time) than is either VO2 max or the running economy. Lactate turnpoint and respiratory ventilation threshold (a.k.a. anaerobic threshold) are other variable that accurately predict athletic performance, particularly in running events of 10 to 42 km. Many arrhythmias observed in athletes can be considered normal for this population and are not related to any pathology. Several of these rhythm and electrocardiographic changes seen in aerobic athletes at rest resolve during exercise. Routine screening for cardiovascular artery disease for asymptomatic athletes is not recommended due to the high rate of false positives. If the athlete is able to exercise at maximal intensity without difficulty, it can be concluded that abnormal ECG changes are likely attributed to the Athletic Heart Syndrome. Hypertension (high blood pressure) is only a risk factor for cardiovascular disease and not necesarily considered a Cardiovascular Disease in itself (see Modified ACSM Risk Classification Form), particularly since 95% of diagnosed hypertension is idiopathic (no known cause). It is also known as Essential or Primary Hypertension. Essential Hypertension is likely caused by and interaction between genetic and environmental factors. Also see Vitals Calculator. The aerobic capacity of women is typically about 10-20% less than men (Astrand, 1977). VO2 max steadily increases during childhood and reaches a peak at around the age of 20, after which, it slowly declines. The VO2 max of a highly trained endurance athlete is about twice that of an average person. An overestimation of VO2 max can result from failure to achieve steady state or rail holding during treadmill testing. Other inaccuracies can result from improperly calibrated ergometers and factors that change mechanical efficiency such as wind, snow, sand, and gait abnormalities. Muscle mass and strength in older adults (73.72 ± 6.23 years of age). Halil M, Gurel EI, Kuyumcu ME, Karaismailoglu S, Yesil Y, Ozturk ZA, Yavuz BB, Cankurtaran M, Ariogul S (2013). Digit (2D:4D) ratio is associated with muscle mass (MM) and strength (MS) in older adults: possible effect of in utero androgen exposure. Arch Gerontol Geriatr. 56(2):358-63. Hone LSE, McCollough E (2012). 2D:4D ratios predict hand grip strength (but not hand grip endurance) in men (but not in women). Evolution & Human Behavior. 33(6):780-789. Manning JT1, Morris L, Caswell N (2007). Endurance running and digit ratio (2D:4D): implications for fetal testosterone effects on running speed and vascular health. Am J Hum Biol. 19(3):416-21. Giraffes have the highest blood pressure at 280/180 mm Hg. It's remarkable how little fitness is required to be considered 'average' nowadays. See girl's push-ups norms. In 1945, a score 32 repetitions for high school girls push-ups was only 60th percentile. Keep in mind, girls push-ups were with the knees straight (sometimes performed holding on to a 13" high stall bar bench) lowering the body until the chest nearly touched. Interestingly, the boy's push-ups were described as what we call dips performed on parallel bars. Metheny E (1945) Physical performance levels for high school girls, Journal of Health and Physical Education, 16:84. Willgoose CE (1961) Evaluation in Health Education and Physical Education, McGraw-Hill Book Company, Inc. pg 136-137. 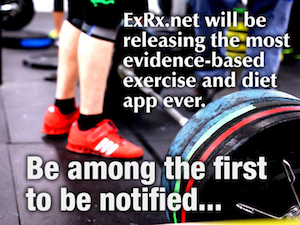 The results of ExRx.net calculators can be copied and pasted into an e-mail or document and presented to others for exercise testing and prescription. Alternatively, the results can be printed directly from the ExRx.net and can be given to the individual. A copy can also be kept with the individual's raw data, (e.g. fitness testing sheet) for future reference. The entire contents of the ExRx.net web site is also available on CD-ROM for off-line use.